bi-directional bubble tight shut off. 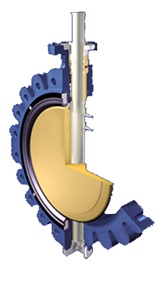 Wafer type butterfly valve, semi lug, with centric disc and bonded liner. 100% bi-directional bubble tight shut off. 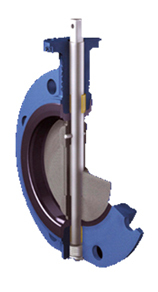 Full wafer lug type butterfly valve with centric disc and bonded liner. 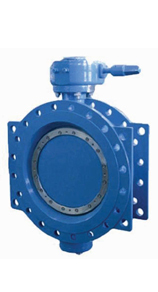 Mono flange type butterfly valve with centric disc and bonded liner. The NSJ has an eccentric design. is extremely simple and does not require removal of the actuator. 100% tight shut off up to 16 bar with the preferred direction of flow. The preferred direction of flow is indicated on the body. Applicable for all kinds of industries but specially designed as cargo or ballast valve. 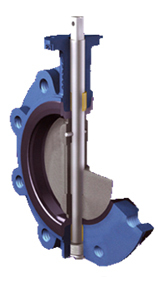 Duvalco double flange eccentric type butterfly valve are designed to the requirements of BS EN 593 and are of eccentric design which gives positive leakproof shut off on rubber to metal faces. Face to face generally in accordance to EN 558 Series 13 (BS), Series 14 (DIN F4). 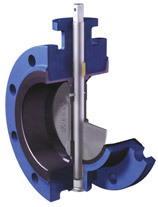 Duvalco HP7400 high performance is of a double offset type valve. 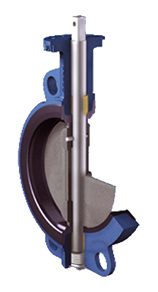 Double offset provides excellent controlling, bubble tight shut off, greater seat life and smooth operation.